Also see my Super Conference post for another potential way the conference realignment could pan out. With a month to go before the last college football season under the control of the BCS kicks off, the college football talk has taken off once again. Inevitably, the constant conference realignment comes up. Syracuse and Pitt are now in the ACC, Maryland and Rutgers are playing their last seasons in the conferences they helped start before they jump to the Big 10, and two conferences are completely gone (the Big East is now the American Athletic, the WAC is just gone). There are definitely more changes to follow. On top of this is all the talk of "pay-for-play" and the controversy of the NCAA exploiting their athlete-students. It has even been announced that this is the last year of college football video games for awhile until the Ed O'Bannon trial is ironed out. As the major conferences held their media days in the last few weeks (which got a crazy amount of coverage ... seriously I can't wait for the football seasons to start so all the completely meaningless talk stops), these topics came up. One of the ideas that was thrown out there to solve all the NCAA issues is to create a "Division 4" in the college football ranks. This division would be made up of the top conferences in the nation: ACC, SEC, Big 10, Big 12, and Pac 12. The basic idea that was proposed is these five conferences and their schools leave the NCAA and their restrictive unrealistic rules and regulations and start their own division of college football where they make their own rules that the big-spending universities involved will benefit from. Some of the potential rules could be setting a pay scale for top recruits or even a bidding system or auction for the top prospects. This would actually solve a huge problem I have seen with college football in that over half of the FBS every year have absolutely no chance of competing for a championship. This would basically make Division 4 the "BCS Division" and what is left of the FBS its own division that schools like Boise St., Northern Illinois, and Cincinnati could compete for. This system has some interesting ideas that could actually be very beneficial for college football. However, it also has some things that could potentially ruin the sport. Having a "pay-for-play" system is inevitable, but a group of all the rich schools breaking away from the NCAA to make their own rules? Before you know it, blue chippers would be making $20 million per year (you know boosters would pay it), and who knows, maybe the good players will be able to have 6 years of eligibility. These are some pretty extreme scenarios, but you're lying to yourself if you say it's out of the question. You need a third party governing the sport. However, there are some interesting ideas that could make college football even more exciting. Like I already said, and have discussed extensively in my yearly series of Holiday Madness articles, this would give the non-BCS schools something to compete for besides playing in the Motor City Bowl. They could actually win their own National Championship. It wouldn't be covered quite as much as the BCS schools, but that is about where these schools are at right now. The randon Tuesday night Toledo vs. Kent St. will still be found on ESPN. The only difference is the game might actually mean something where now a game like this is fairly meaningless. There is also something else they could do with this system that would add some serious intrigue. This part is really just me exploring possibilities. It isn't something that has been mentioned, or honestly, anything that could actually happen. However, it would be pretty amazing. One of the problems some people in the system have given with the current constant realignment is it is really easy for a school to move up the ladder (Boise St., TCU, Utah, any team the new AAC takes in), but it is next to impossible for any team to move down the ladder. For example, Utah was elevated from the second tier Mountain West to the top-of-the-line Pac 12 after a great 5 year run or so. However, for the last five years Colorado has been one of the worst teams in college football, BCS or not. No one has even considered dropping them out of the Pac 12 or their old home, the Big 12, due to lack of performance. The cool kid table is only getting bigger. If everyone is cool, it's not that cool anymore. So how do you fix that? My solution is to do something I think a lot of sports leagues would benefit from: adopt a system like Europe's Premier League Soccer. This system takes the worst teams in your top division of competition and swap them out for the best teams in the next level down. This gives an opportunity for quality small programs to get a shot at the big prize while also penalizing programs that are in disarray. This is how I would set it up. Take the ACC, SEC, Big 10, Big 12, and Pac 12 (the main BCS conferences) and make a "Division 4" still under the control of the NCAA. These schools may even be able to have some different rules on what they can do in pay-for-play scenarios. This is your "Premier League." Then, I would pair up each conference in Division 4 with one of the leftover FBS conferences (with the WAC gone and the artist formerly known as the Big East moving down, there are five in each division). This conference would act as the lower division of the top conference and would be chosen by general geographic location. Then every year, the champions of the AAC (Big East), Mountain West, Sun Belt, MAC, and Conference USA are invited to join their corresponding Division 4 conference, and take the place of the worst team in that Division 4 conference. So every Division 4 conference would not only have a Conference Championship game, but they would have a Conference Survival game between the worst two teams in each division. You then hold an 8 team playoff in each division between the 5 conference champs and 3 "Wild Cards." Some people from inside the system would oppose this because every year every school would be in danger of losing the money and prestige involved in being in one of those top conferences. Schools like their security blanket. Others would also oppose this for potential losses of classic in-conference rivals. If Wazzu tanks again and drops out of the Pac 12, what happens to the Apple Cup? Well, you can still make sure that game is played for one. Also, no one can complain about tradition anymore. 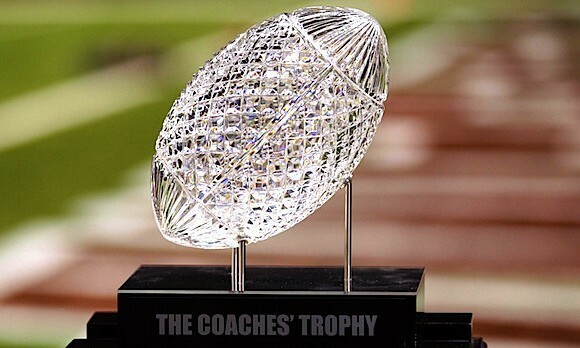 There is a four team playoff using the "traditional" bowl games starting next year, teams like Nebraska, Syracuse, Texas A&M, Maryland, and Rutgers have left the conferences that defined them for more prestige and money elsewhere which destroyed their "traditional" rivalries. Tradition was thrown out the window in favor of money and competition once this whole madness started. One thing that would have to be specified is these conference movements would have to be confined to football. This is one of the things that has bothered me about all the realignment. Moves are made to benefit football, but it severely messes with the basketball front. When you start this system, lock the conferences in all other sports. Keep all the movement to football alone. Then contracts would have to be signed between the Division 4 conferences and their assigned FBS conferences so that the money compensation for conference membership stays consistent. If you are having trouble picturing this, let's look at what it would look like. Here are the potential conferences and their partners. I took into account proposed conference movements scheduled to take place over the next few years as well as made some other conference changes to make the system work. All current independents were assigned to a conference, and other movements were made to even out the numbers in some conferences. Let's look at what could happen! There are a lot of potential changes coming to this division. 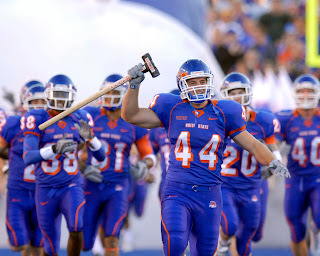 Mew Mexico St., Idaho, Georgia Southern, and App St. are all scheduled to join the league in 2014 while others are departing for greener pastures. This is also the only conference with an odd number of schools so it allows for one more school to come up and join FBS if wanted. With the addition of the new schools, they have enough to split into divisions. These divisional placements are simply a guess on my part. Now if this was in place last year, that would mean Arkansas St., as last year's Sun Belt champs, would be playing in the ACC this year and Boston College would be dropped to the Sun Belt as the worst ACC team last year. See how this could become intriguing? No one wants to fall out of the upper conference which will force some seriously competitive games from start to finish from every school in the conference. If Boston College is upset dropping out of the conference, go out and win the Sun Belt the next year. Then you are back in the ACC. Will Arkansas St. compete for an ACC title? Probably not, but I bet they compete and possibly beat schools like Duke, Wake Forest, and Virginia. At the start, this may not affect much, but it should spark some parody in the future. I moved Tulsa to the MAC simply to balance out the conference. Last year, this setup would have meant Northern Illinois would swap spots with Illinois. What a story that would be! 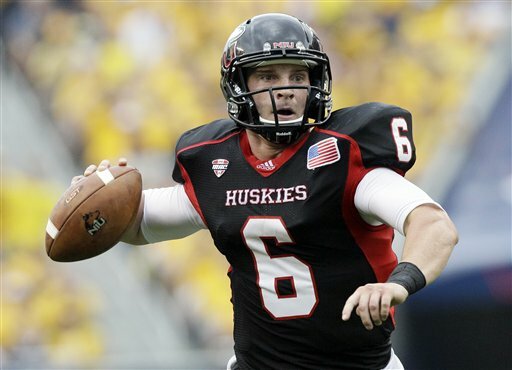 Could Jordan Lynch survive a season of Big Ten competition? Maybe not, but it would be fun to watch. Could the struggling Illinois dominate teams like Ohio, Toledo, Tulsa, and Kent St. and work their way back to the Big Ten? Maybe. Another possibility this opens up is a new consequence for violations. The Big Ten had some trouble last year with two top teams (Ohio St. and Penn St.) on post-season bans. Maybe instead of giving Ohio St. a one year post-season ban for improper benefits, you give them a one year Division 4 ban. They are forced down to the MAC with less conference money, and aren't eligible to work their way back up for a season. That would mean last year and this year Ohio St. would be banished from the Big Ten. Again, it probably wouldn't happen because Ohio St. is too much of a moneymaker, but if you are doing what is best for the game it would happen. Instead, too many decisions are made depending on what is best to make more money. Old Dominion and WKU are slated to join the conference in 2014, while Charlotte is planning on joining in 2015. The potential movements from last year would have sent Kansas down to Conference-USA and Tulsa (who won't even be in the conference anymore after this year) to the Big 12. This leads to one of the other benefits of this system. Conference realignment should stop after this because no matter which conference you are in, you have a potential to work your way up to some serious notoriety. This conference, unless everything moves to Super-Conferences and they add some Texas teams, is locked in with these 12 teams. Can't see any more movement happening. They would have the most intriguing pairing. A couple additions this year from the dead WAC makes this conference even stronger. I believe this is the strongest conference outside the Big 5. If this was in place, it would mean Boise St. would be playing in the Pac 12 this year, and Colorado would drop down to the MWC. Now this is really interesting because I see Boise St. competing for many years before being threatened with being sent back down. On the other side, I see Colorado struggling for many years trying to get back to the Pac 12 as they cold fall behind Nevada, Fresno St., and Utah St. at least in the power rankings of the Mountain West. This may be the conference that is most desired for other teams to get into. It also might be the most solidified. The competition to stay in the conference will be just as fierce as the competition has been to win the division. They will be paired with probably the most respected lower level conference. Tulane and East Carolina join the conference in 2014, as well as Navy talking of working their way there soon too. If Navy goes, it only makes sense for me to throw Army in there too. Tulsa is also scheduled to join in 2014, but I had to move them elsewhere. Looking at last year, Louisville (who is in their last year in this conference) would take Teddy Bridgewater to the SEC and swap with Kentucky, who I think could struggle winning in the AAC which may not have a really high level of competition, but they beat each other up. I am fascinated by the potential of a system like this. It gives the exclusivity some schools want for the top conferences in football, but also allows for some parody and constant renewal of fresh competition. Like I said, it wouldn't look very strong at first, but as the system establishes itself it should bring strong competition all over college football. Also, I doubt it happens this way simply because of the risk it puts some of the big schools in by the threat of dropping down if their level of competition doesn't measure up. Again, decisions are often made to benefit the moneymakers and not the sport as a whole. This would be a great system for all involved with no one above the law. So what do you think? I love looking at the potential ways this could all work out. I have now proposed three different systems that, honestly, would all be better than where the sport seems to be heading. Which do you like best? Division 4? Super Conferences? Holiday Madness? Something completely different? Let the discussion begin. Let's solve all the problems!